Meleana Brown came into Duets a week after the rest of the contestants, replacing one of John Legend's partners, Johnny Gray. She started off her time in the competition with a bang, impressing with her rendition of "Endless Love". She fell to the middle of the charts in week 3, then battled against Olivia Chisholm to stay in week 4. She was eliminated from the competition and we spoke to her today about her time on Duets in an exclusive interview. After three weeks of performances on Duets, the judges were finally ready to make a decision as to who they should send home. Alexis started at the top of the charts in week one but slipped further down with each passing performance. She went head to head in an a capella battle against Jason Farol but lost in the end. She became the first singer eliminated from the competition and we talked to her today in an exclusive interview about her time on Duets. 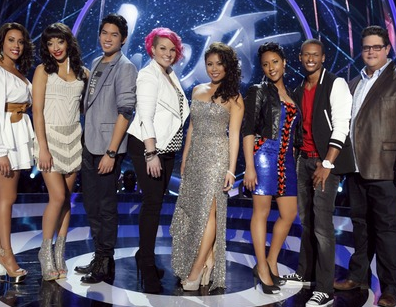 This week's episode of Duets kicks off with another performance by the four mentors/judges. No amateurs were eliminated last week and they'll have this week's performance too to help them win America over. Will Kelly be able to pull her people out of the bottom and will J Rome be able to hold onto the top spot on the charts? Let's find out!